Booking Mama: The Reagan Arthur Challenge -- Are You In? Last Friday, I received a special edition of the Shelf Awareness newsletter that really caught my eye. The entire newsletter was devoted to a new Little, Brown & Company imprint called Reagan Arthur Books. I noticed how awesome (and diverse) the Reagan Arthur new and upcoming releases are, and I immediately contacted my good friend Kathy (aka Bermuda Onion) and told her that someone should do "The Reagan Arthur Books Challenge." The basic idea of the challenge is really simple — to read Reagan Arthur Books. Since the imprint will be continually releasing books, this is a perpetual challenge so there are no deadlines. You don't even have to commit to reading a certain number of books. We just want this challenge to be fun (that means stress free), and we intend to do lots of fun giveaways -- just wait until you see the first one! We are giving away a six book prize pack of current and soon-to-be released Reagan Arthur books to one lucky person who signs up for this challenge before February 28, 2010! We’d love to have you join us. 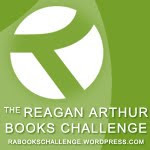 To learn more about the Reagan Arthur books and the challenge, make sure you visit the challenge website. And while you are there, I hope you will consider signing up! I'm really excited about this and thank you for allowing me to join you in hosting it. I'm in and so excited about it! Yes, yes, yes!!! I'm in!